Porcelain Laminate Veneers – What is It? عدسات الفينيرهي قشور رقيقة من السيراميك على الجزء الأمامي من الاسنان. يتم استخدامها لتصحيح العيوب التجميلية على الأسنان أو لتصحيح (طريقة تجمع الأسنان). و تشمل عيوب التجميل التي يمكن تصحيحها باستخدام القشرة الفينيرللأسنان التي تكون أسنان ملتوية أو الملطخة قليلاً ، للأسنان المتكسرة ،والفجوات الموجودة بين الأسنان أو للأسنان الغير المتساوية هذه الطريقة الوحيدة لتصحيح هذه العيوب أو غيرها عن طريق تغطية الأسنان مع تيجان بقشور او عدسات الفينير. القشرة لها مزايا عديدة على الاسنان. لا يوجد بحيث نضع هذه القشور بشكل متوازي مع الاسنان القديمة. وبالتالي ،يكون لديها مظهر أكثر شفافة لتعطي مظهرا طبيعيا جماليا. ومع ذلك ، فإنها تحقق نتيجة جمالية نابضة بالحياة. تبدو القشرة البورسلين الأفضل و التي تستمر لفترة أطول. الإجراء يتطلب عادةً تحضيرًا خفيفًا لقياس الاسنان. هذه القشورتختلف قياسها وسماكتها لنستطيع وضعها في مكانها الصحيح لتصبح قشرة الاسنان قوية جدا يجب ان يكون قياسها من 0.3 مم الى 0.5 مم. بمجرد وضعها في مكانها الصحيح ، تصبح قشرة البورسلين قوية جدا. بحيث تعطيك مظهر مفعم بالحياة مع القوة والجمال والمتانة بحيث يكون معدل النجاح مرتفع ، ويمكن أن تستمر حتى 15 سنة أو أكثر. أي شيء من شأنه أن يكسر أسنانك الطبيعية يمكن أن يكسر قشرة الخزف ، على سبيل المثال ، الحلوى الصلبة أو الحلوى المجمدة. عدسات الفينير هي مقاومة للبقع للغاية. عدسات الفينير هم اختيار جيد لعلاج الاسنان لاكتساب اسنان صحية سليم. Veneers usually require three dental visits: one for a consultation and two to complete the veneers. The procedure requires two separate appointments, approximately 5 days apart to complete. This is because the veneers are constructed in an offsite laboratory. To select the most appropriate option for you we evaluate your case, review all available options. Clear goals are essential to avoid any misunderstanding that could compromise the esthetic results, and when fully understood by all parties involved (dentist-technician-patient), the best results come out. So in your visit to get a better idea instantly of what the eventual outcome will be, utilization of the composite mock-up is a wonderful aid. It is the direct application of composite without surface preparation that perches itself on the teeth. Over this mock-ups we can open a discussion with you how your smile can be modified. Instead of computer imaging this technique is much better, because you can see, and feel how your smile will be. So we get the predictability of the outcome. After the application of mock-up we take the diagnostic study models, photographs of the mock-up, and your original teeth. The technician designs a wax-up for you so we make another try before we go with the preparations. On the second visit, following the consultation visit the composite made from the wax-up prepared for individually for you, is seated on your unprepared teeth so that we can examine both the esthetics and function before we start the preparation. When we are both happy about your new smile and functions, we can go with the necessary preparations. With these procedures done, you will have no surprises when we finish the case. It also makes the preparation more conservative. The wax-up rules. 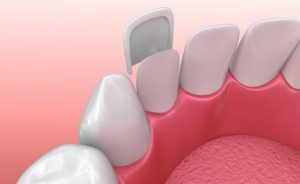 If you have lingually inclined tooth, less tooth structure must be removed and vice-versa. In some cases, no enamel has to be removed, but we may need to remove up to 1 millimeters of enamel to accommodate the thickness of the veneers.. This procedure is not painful, but it may be uncomfortable for some people. We will use a local anesthetic if necessary. Next, we will take an impression of the teeth, which will be sent to our dental laboratory. You will get your temporaries immediately afte preparation, just as same as your wax-up. So while the laboratory will be manufacturing the porcelain laminates by copying your wax-up model to fit your teeth, you wil have the chance to test you new smile both visually and functionally. It is just like a test-driving. Your temporaries will be prepared from resin based material. That will be the only difference from your porcelain veneers. It usually takes 5 days for the veneers to be made. The veneers will be applied during the third visit. We will apply them temporarily with water, so we can check the fit and color and you can see what they will look like as porcelain. Once you’re satisfied with the veneers, your dentist will clean your teeth thoroughly and cement the veneers with bonding agents, which are hardened with a high-intensity light. With this method, it will be very easy to get used to the appearance and feel of your new teeth, since you already had the copy of them in your mouth..but you won’t have to do anything special to care for them. You should be careful not to bite your nails, chew on pencils, ice or other hard objects, or otherwise put unnecessary pressure on your teeth, because the veneers can come off. You won’t have to change the way you floss or brush. Porcelain veneers and crowns are permanent restorations, and they can be expected to last for many years. If you have a bruxing (grinding) or clenching habit unless a protective mouthguard is constructed for you. Also, there are no food restrictions – once they are cemented you can eat normally, porcelain simply covers the imperfections in your own smile! Dental recontouring is a relatively quick and painless procedure in which small amounts of tooth enamel are removed in order to change the length, shape or surface contours of a tooth. It is also called tooth reshaping or odontoplasty. It is one of the most conservative cosmetic procedures. It is an effective way to correct minor imperfections and can improve overall dental health by removing minor crevices or overlaps in which plaque or tartar can accumulate. You should understand what recontouring can and can’t do for you so you have realistic expectations. In the beginning we will show you, what your teeth will look like after the procedure is done. 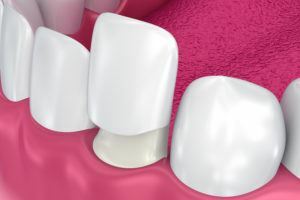 When tooth imperfections can’t be eliminated with recontouring, we may combine the treatment with bonding, in which a composite resin is used to repair or restore fractures, chips or cavities. Because recontouring doesn’t affect the living pulp of the tooth, it usually can be done without an anesthetic. It can be done only when the overall tooth structure is sound. We will take X-rays to determine the size and location of the tooth’s pulp, the center of the tooth, which contains the nerves and blood vessels. If the tooth has a relatively thin layer of enamel, or if the pulp lies close to the surface, recontouring may not be possible. Because recontouring doesn’t involve the use of artificial materials, your teeth don’t require special care after the procedure. If we use a composite resin to bond one or more teeth, however, you’ll need to take extra care to keep your teeth clean to prevent staining.